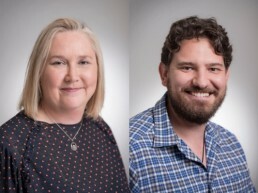 Grochem Australia is expanding its team, with the appointment of Nicholas Kocyan as product development and technical services manager and Catherine Cousen as customer service officer. Mr Kocyan is providing technical support for customers as well as developing Grochem Australia’s R&D program under the direction of general manager Ben Coombe and research and development manager Iain Latter. Grochem Australia is a leading supplier of innovative options for growers including plant nutrition products, insecticides, fungicides and plant growth regulators, mainly for use in horticultural crops. A La Trobe University graduate in agricultural science, Mr Kocyan has a strong background in plant pathology after four years at Bayer Crop Science and BASF. He worked closely with growers, suppliers and sales teams to set up and manage field and glasshouse trials at Bayer’s wheat and oilseeds breeding centre at Longerenong in the Victorian Wimmera. As part of this program, he also managed collaborations with R&D partners including the Grains Research and Development Corporation, University of Sydney, CIMMYT Australia and ICARDA Germplasm Evaluation (CAIGE) and Departments of Agriculture in Western Australia and Victoria. Mr Kocyan continued his plant pathology work to develop a new wheat variety for the Australian market when Bayer sold this program to BASF as part of a global divestment earlier this year. Early in his career, Mr Kocyan volunteered at a community organisation to help set up a horticultural operation supplying fresh fruit and vegetables for up to 3000 residents and guests per year. “I am looking forward to contributing to Grochem’s growth in Australia and working more closely in horticulture,” he said. Meanwhile, Catherine Cousen has joined Grochem Australia to strengthen the company’s service to customers alongside Samantha O’Donnell. Ms Cousen comes to Grochem Australia after three years with Landmark, where she was operations planner for specialty fertilisers. Her customer service responsibilities there included ordering, forecasting, sales reporting and coordinating stock movements nationally. “We welcome Nicholas and Catherine to Grochem and look forward to introducing them to our customers in coming weeks,” Mr Coombe said.